Experience the Arctic through the eyes of Le Soleal's captain. "As we reached the most northerly latitude of our voyage," writes Capt. Etienne Garcia, "optimal conditions enable us to undertake an exceptional landing on the ice floes off the coast of Ellesmere Island, the northernmost island of the Canadian Arctic Archipelago. "Before us stretched luminous landscapes as far as the eye can see, untouched and pristine ice floes, coming straight down from the North Pole, revealing only the tracks of a polar bear that had recently been in the area. 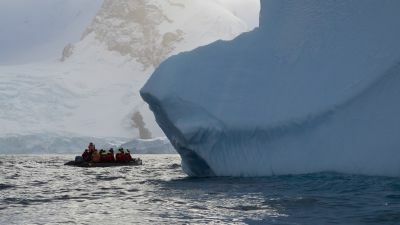 "We enjoyed the majestic panorama, in the middle of the emblematic Nares Strait, the final frontier between the extreme north of Canada and Greenland. A highlight and an extraordinary experience for all the passengers." Ponant's Le Soleal. This and the top image by Laurence Fischer​. Ponant's expedition also takes in the human-aspect of the world's most northerly reaches, an experience expedition leader Nicolas Dubreuil says is unforgettable. He writes of the voyages encounter with the inhabitants of Kullorsuaq, a remote village in Greenland. "Everyone was keen to get to know each other. We had prepared a typically French picnic and the 180 Greenlanders present offered to share their traditional meal with us," Mr Dubreuil writes. "The two cultures came together and interacted to the sound of the crackling of the wood fire, of Inuit dancing and singing... The passengers introduced the inhabitants to smoked ham and the taste of fresh butter. The Greenlanders taught our passengers how to recognise the herbs that flavour the local meat cooked directly on the stone. "We danced, we sang, we chatted, we laughed, we talked with our hands... until the end of the night. This evening would leave indelible marks in everyone's hearts. A warm breath of humanity in the middle of the icebergs." Ponant's next cruise into the heart of Ultima Thule - from Greenland's west coast to the Arctic Cordillera's montains to the tundra in the High Arctic Thule region - next departs July 29. The 17-day expedition costs from $22,200 per person twin share. 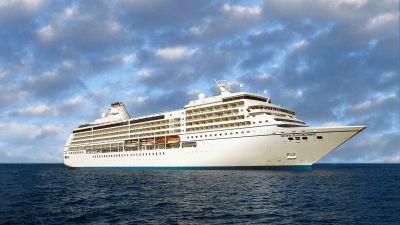 For more information and bookings see au.ponant.com.